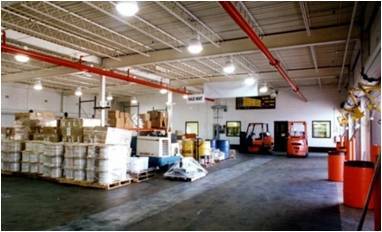 When Con-Way Central Express, a nationwide trucking firm, purchased an abandoned seven acre terminal site in Carlstadt, NJ, they acquired a facility that needed major renovation. 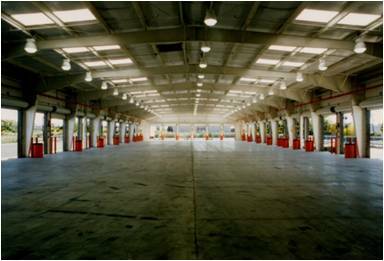 The existing terminal consisted of 72 loading/unloading docks and doors, with 8,000 sq.ft. of office area. Most of the site not occupied by buildings was paved as a truck parking area. With a desire for quick occupancy and an efficient cost effective design, Con-Way awarded EI Associates the design and construction management assign-ment for the renovation and upgrading of their new terminal. The project included a 44 door addition to the terminal, a new fuel depot, as well as complete rebuilding of the office and maintenance facilities and demolishing and removal of about one-half of the maintenance building. A key aspect of the project is the fact that the site required permits from the Hackensack Meadowlands Development Commission for all of the construction work. EI made early contact with the Commission and reviewed preliminary plans for the work, averting later delays in the permitting process. Our firm’s environmental focus allowed us to provide design that mitigated the new facility’s impact. Since the site lies within a “tidal flood plain area”, additional water quality issues had to be addressed for approval of the stream encroachment. Both on-site and off-site drainage systems needed work. A new fuel depot was designed and built, with above-ground fuel storage tanks and dispensing pumps. A fully automated card-access system was also designed to permit unattended fuel dispensing. Tankage, piping and dispensing was designed and installed with all applicable safety and environmental requirements.